Unleash the beast within your F-150 with this gibson catback sport dual exhaust!!! The Gibson Sport Dual Exhaust System is specially engineered to each and every model to make sure each system is a perfect fit. The Sport Dual Exhaust will add a sporty look to your F-150 while giving it that deep aggressive tone Gibson is known for. Each system is crafted from either aluminized steel or stainless steel, both include 2 T-304 stainless steel tips that will never rust and will outlast the life of your truck. This System is guaranteed to up your truck 15 - 20 horsepower while still giving you as much as 2-3 MPG. This Cat Back is specially designed to create the perfect amount of back pressure to guarantee that every time you hit the gas you will be pushed back into your seat. 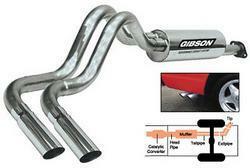 With today's market flooded with trucks this Gibson Sport Dual Exhaust System is a must have for you 2009 F-150.